Next to beautiful Gait Barrows near Arnside is the Coppice Co-op depot. From here, a group of seven people manage the woodland and make traditional coppice products; such as hazel hurdles, bean poles, baskets, charcoal and gates. Coppicing is a traditional, sustainable and productive form of woodland management, which involves cutting trees off at ground level, on a cycle of between 5 and 30 years, causing many rods (rather than one large trunk) to grow from the stump or ‘stool’. It is a sustainable way of producing timber. Coppiced trees have strong root systems, which mean they can regrow quickly. Planting new trees from seeds is less reliable as saplings may be eaten or damaged by wildlife, and it can take a long time for them to be strong enough to use. Coppicing also opens up the woodland, enabling more natural light to get through the canopy, which means more biodiversity on the woodland floor. Rebecca Oaks set up the depot in 1998, and later took on Sam Ansell as her apprentice under the Bill Hogarth apprenticeship scheme. Bill Hogarth had come from a long line of coppicers, and took care to train the next generation – when he died, the people who had benefited from his knowledge and training set up an apprenticeship in his name. Around 20 people have now trained as coppicers through the scheme. Sam took over the depot in 2009 and worked with the rest of the team to set up the co-operative in 2013. The seven members of the co-op each have their own specialisms but carry out certain core activities as a team; these include woodland management through the winter, and preparing charcoal for sale. 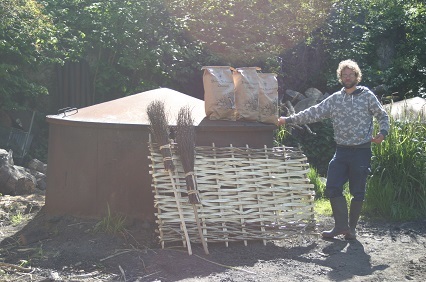 You can buy Coppice Co-op products from the yard by prior arrangement – bean poles, pea sticks, besom brooms, hazel hurdles and screens, oak and ash gates, seasoned firewood and charcoal. Coppice co-op charcoal is also available from Mossdale Service Station on the A6, Londis and the Spar in Arnside. Garden products are available from Carr Bank Garden Centre.